To learn more about grasping and processing large numbers, I spoke to mathematician Spencer Greenberg, co-founder of the A.I. powered hedge fund Rebellion Research, and founder of ClearerThinking.org, an online project offering free, interactive training programs that help people enhance their decision making skills. It shouldn’t be too surprising that humans have great difficulty with large numbers. While living and evolving in a so-called state-of-nature, our paleolithic ancestors had no need (i.e. no environmental pressures) to develop such a capacity. Back then, and prior to the advent of a formal numbering system, early humans only really needed to get a basic sense of small batches of quantities, like the number of people in the clan, or how many animals might occupy a certain area. These days, however, we’re surrounded by large numbers. Like, stupid large numbers. 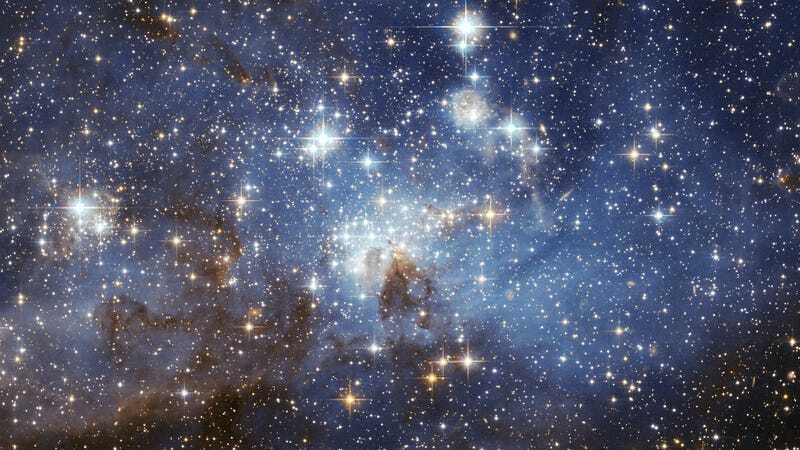 We’re told that there are 7-billion humans on Earth, that there are 300-billion stars in the Milky Way, and that there may be upwards of 70-sextillion stars in the Universe (that’s 1021, or a 1 with 21 zeros behind it). Good luck trying to wrap your head around what such a quantity actually means or signifies. Related: Why We Should Switch to a Base-12 Counting System | Does Infinity Really Exist? But that doesn’t mask the fact that humans are absolutely awful with large numbers. Once numbers get beyond a certain point, they tend to lose all meaning. “We can easily visualize five things,” says Greenberg. “We can even roughly visualize approximately 100 things — by, say, picturing a large crowd gathered. But when we’re talking about millions of things our ability to visualize completely fails.” He says that trying to imagine a million people is about as useless as trying to imagine a hundred million. Indeed, our eyes could easily miss that one is a thousand times bigger if we’re not paying close attention. But thankfully, there are some tricks we can use to help us make better sense of numbers like these. Greenberg says it’s a good idea to convert large numbers to a different unit to make the large numbers smaller. For instance, the U.S. national total public debt is about $17 trillion. That number is nearly impossible to understand intuitively if left in units of dollars. But there are two much easier ways to think about it. The other way to think more intuitively about this is that the U.S. has about $16.8 trillion in GDP, so the debt is about equal to the total market value of all final goods produced in the US in a single year. We’re often confronted with excessively large figures that would be better expressed with a different unit, like switching from feet to miles (or meters to kilometers), from ounces to pounds, from seconds to years, and so on. That said, be sure to avoid units for which you don’t have an intuitive grasp. Most people, for example, have little intuitive sense of how much a tonne of weight is. What does it mean to think about 400,000 people? One thing I like to do is break it down into something I’m familiar with and that I can kind of visualize: the crowd attending a sporting event. For example, hockey arenas seat about 20,000 people. So, you could envision 400,000 people as 20 hockey arenas worth of people. Or as Greenberg told me, if you have $100,000 worth of savings, that means someone with a hundred million dollars has 1,000 times more money than you. No doubt, 1,000 is way easier to wrap your mind around than a hundred million. This technique can also be used to assess risk. Again, like the previous trick, just be sure you really understand those familiar units as well as you think. Another great idea suggested by Greenberg is to incorporate time to turn numbers into occurrences over time. Here’s another example: San Francisco’s metro area has about 4.3 million people. How many is that? Well, if you spoke to each person for one minute, and you did that eight hours a day, it would take you 24.5 years to speak to them all. Whoa. “To me, that gives me the sense of how insanely unknowable a community of that size is,” adds Greenberg. This reminds me of a tactic used by the Soviets at the Battle of Stalingrad during World War II. To demoralize the enemy, loudspeakers blared this rather discouraging message: “Every seven seconds a German soldier dies in Russia.” In reality, it was closer to nine each minute. That’s about 540 deaths an hour, 12,960 a day, 90,720 a week, or 388,800 a month. I asked Greenberg if exponents, or scientific notation, can be helpful. He said that scientific notation is fantastic for helping us calculate with large numbers — 10 billion divided by 1 million becomes 1010 / 106 = 10(10-6) = 104 — but it is not very helpful for grasping them intuitively. In fact, for intuitions sake, he says it can be confusing. Needless to say, there are limits to these tricks. We can only manipulate these figures so much before they once again regress into meaninglessness. For example, I asked Greenberg how we could better conceptualize something as large as the total number of stars in the Milky Way, which has about 300 billion stars. Ultimately, Greenberg says large numbers will remain beyond our grasp (at least until the era of human cognitive enhancement), especially the really huge ones, and ones that we can’t relate to meaningful things we already understand.